Amy's Daily Dose: FREE Go & Grow by Similac Samples and up to $40 in Coupons!! FREE Go & Grow by Similac Samples and up to $40 in Coupons!! 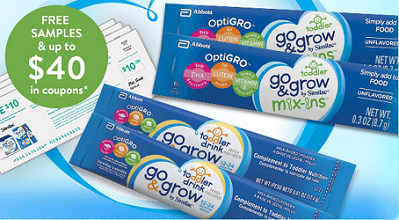 Get FREE Go & Grow by Similac Samples and up to $40 in Coupons! Product samples are meant for kids 1 year and older. 1 packet of Food Mix-Ins = 1 serving. 2 packets of Toddler Drink = 1 serving.